UNP Parliamentarian Wijedasa Rajapakse has officially announced that he will be in the running for the post of President for the Bar Association of Sri Lanka(BASL). So, last week The Sunday Leader journalist Raisa Wickrematunge met with him to discuss his reasons for stepping forward and his thoughts on what needs to be changed. Raisa asked him; you have been involved with both the government and the UNP, in fact you are still a Member of Parliament. Do you think you would be able to remain impartial and free from political bias, if you were elected? Has he ever demonstrated his impartiality or bravery with regard to the independence of the judiciary? My answer is no! In conjunction with an independent judiciary and a free media, a robust and independent legal profession is essential for maintaining the rule of law and ensuring the protection of human rights in a Democratic society. Lakbima News Chief Editor Rajpal Abeynayake was assaulted at the annual dinner of the Bar Association of Sri Lanka held on the night of December 3. Abeynayake was assaulted on that night by another lawyer, for remarks he made about the former chief justice Sarath Nanda Silva. Did you condemn this assault? If not why? A fact-finding mission by the International Bar Association visited Sri Lanka between August 28, 2001 and August 31, 2001. The focus of the mission was twofold: (1) to identify the circumstances surrounding the calling of a referendum on the Constitution, assess the constitutional position of such action and the implications for the rule of law; (2) in the light of recent cases seeking to disbar the Chief Justice from practising as a lawyer and attempts by over one-third of Members of Parliament to have him impeached, to examine the guarantees for the independence of the judiciary, and the practical respect these guarantees receive. What was Wijedasa’s position on these two critical issues? The Constitution provides just two routes for constitutional reform. The first requires the placing of a Bill setting out the amendments before Parliament and no less than two-thirds of all MPs voting in support of it. The second applies to the reform of ‘core’ provisions within the Constitution and requires the support of the Sri Lankan people through a referendum, in addition to a two-thirds majority in Parliament. The President, at his/her discretion, can hold a referendum of the people under Article 85. However, constitutional reform via an Article 85 referendum is specifically prohibited. Under Article 86, the President may submit to the people by referendum any matter which, in her opinion, is of national importance. However, as there are no prescribed consequences flowing from an Article 86 referendum, any result is almost certainly not legally binding as to any constitutional effect. The Supreme Court has never been asked to consider the legality of a referendum under Article 86. In that time, the Centre for Policy Alternatives organised a seminar regarding the matter. I was there too. Wijedasa was a speaker. What did he say? He said such a referendum was lawful and he justified it using the principle doctrine of necessity. But, what did the IBA say? The delegation concluded that the Government’s call for a referendum as a route for constitutional change was: i) Unconstitutional. And ii) Framed in terms that were not readily comprehensible to lawyers and certainly not to electors. So, why then did President’s Counsel Wijedasa Rajapakse defend that unconstitutional position? It was a well-known fact that he was an apple-polisher. With regard to Sarath Silva’s misconducts has he ever spoken against him? No! Instead of condemning the most corrupt Chief Justice Sarath Silva and his misconducts he spoke on behalf of him and spoke against the activists, journalists and lawyers who raised that issue. (read the Silumina/Dinamina/Daily News and listen to ITN/Rupavahini talk shows for Wijedasa’s attitude on these issues). Former President Chandrika Kumaratunga during her tenure publicly criticised one of the Supreme Court judges at a public meeting, stating that he is an obstruction to the Government’s progress. Further, the then President accused an unnamed Supreme Court Judge of taking a large financial bribe. This accusation was widely published in Sri Lanka’s press. What did Wijedasa Rajapakse do? Has he spoken against it? No! Okay, these issues are now history. I am not saying one cannot change. If Wijedasa has indeed changed he must have shown it. Sadly, he hasn’t shown it either. The former Chief Justice has done immense harm to the Judiciary and Justice in this country. I think there should be an investigation by Parliament. But since Parliament does not have legal minds an International panel of Jurists should be appointed as a Commission of Inquiry by Parliament to go into the allegations that stand against him. What, Mr. Wijedasa is your opinion on this issue. Lord Goodhart QC, who led the IBA delegation to Sri Lanka between February 28 and March 06, 2009, said: “Many of the problems identified in the 2001 IBAHRI Report continue to affect the independence of the legal profession and the rule of law in Sri Lanka and in some respects the situation has deteriorated significantly.” The 155-page report entitled Justice in retreat: A report on the independence of the legal profession and the rule of law in Sri Lanka contains several recommendations to protect the independence of the judiciary, legal profession and media. Instead of adopting internationally-accepted best practice the new Chief Justice Shirani Bandaranayake has let her beloved husband accept political appointments such as Chairman of Sri Lanka Insurance Corporation, a member of its Board of Director the Lanka Hospitals Corporation PLC and Chairman of the National Savings Bank. So, what is your opinion on this issue Mr. Wijedasa? Don’t you think, like Caesar’s wife she too must be above suspicion? Don’t you think this is a conflict of interests? Don’t you think conflict of interest is a form of corruption? Another issue; the appointment of retired Chief Justice Asoka de Silva as Senior Legal Advisor to the President. Today, the Chief Justice, tomorrow an adviser to a controversial Head of the State. What does this imply? 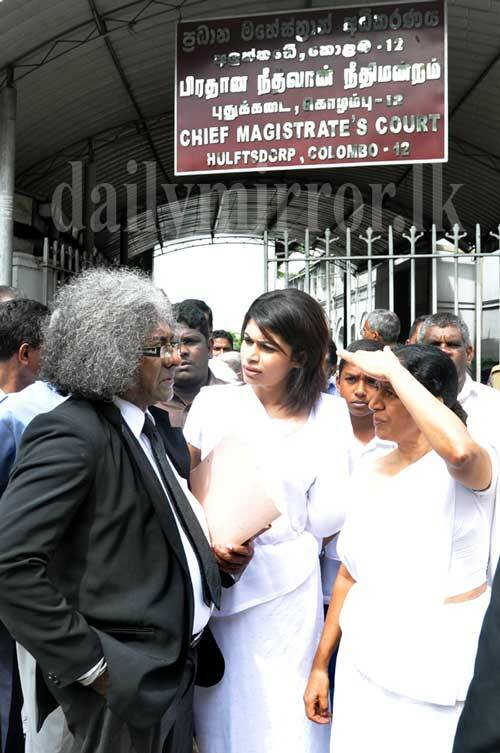 Where is the integrity of Sri Lanka’s judiciary? So, what is your opinion on this issue, Mr. Wijedasa? There is also a new tradition of judges inviting politicians to parties. Justice Sathya Hettige invited President Mahinda Rajapaksa, his brother Minister Basil Rajapaksa, and the Prime Minister D. M. Jayaratne and some other politicians to celebrate his promotion to the Supreme Court. So, what is your opinion on this issue Mr. Wijedasa? Two Sri Lankan Supreme Court Judges are also Judges of the Supreme Court of Fiji, which is under a military dictatorship. The main issue here is the impact their Fijian jobs have on Justices Marsoof and Hettige when they are sitting in the Supreme Court at Hulftsdorp. Can we expect justice and independence from servants of military dictators? What is their judicial mentality? What is their ethical compass in relation to the judicial function? What principles of judicial independence do they adhere to? 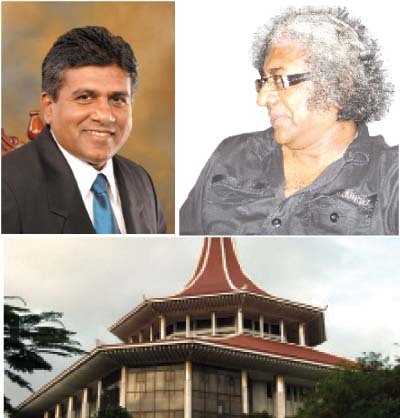 Do they make a distinction between their Sri Lankan and Fijian judicial roles? Can someone serving under a foreign military dictatorship, legitimately and credibly, sit at the same time on the bench of the Supreme Court of Sri Lanka? What can be expected of judges in Sri Lanka who serve a military dictatorship elsewhere? So, what is your opinion on this issue, Mr. Wijedasa? Now, let us see what Wijedasa says about his opponent President’s Counsel Tirantha Walaliyadde. He says; “the BASL passed a resolution not to appear for the accused in the late Ambepitiya’s murder case. It was a unanimous decision. Despite that, he appeared for Potta Naufer.” So what is wrong with it? Article 13 of the Sri Lankan Constitution enshrines the right to a fair trial and to legal representation in criminal cases. Besides Principle 18 of the UN Basic Principles on the Role of Lawyers says; that lawyers shall not be identified with the causes of their clients as a result of discharging their functions. His comment regarding Tirantha shows the level of his impartiality and the level of his legal education. Under the subheading “recommendations to the Bar Association” 2001 IBA report says “The delegation is firmly of the view that an active Bar Association must play an important role in preserving the rule of law and independence of the judiciary. The delegation was sad to note that the SLBA is not functioning to its full effectiveness at present and that it is divided along party political lines.” In 2009, its report says, “The IBAHRI is saddened to hear that in 2009 that politicisation of the judiciary continues.” Politicisation is the main issue here. So how is a politician going to depoliticise the judiciary? If Wijedasa Rajapaksa can do it next time Namal Rajapaksa also can contest! Though his opponent President’s Counsel Tirantha Walaliyadde is not a practising politician he too must answer the above questions. I have never seen or heard Tirantha raise the issues related to the independence of judiciary too. If both of you think those questions are too much to answer then please consider this one. In conjunction with an independent judiciary and a free media, a robust and independent legal profession is essential for maintaining the rule of law and ensuring the protection of human rights in a Democratic society. Lakbima News Chief Editor Rajpal Abeynayake was assaulted at the annual dinner of the Bar Association of Sri Lanka held on the night of December 3. Abeynayake was assaulted on that night by another lawyer, for remarks he made about the former chief justice Sarath Nanda Silva. Did you condemn this assault? If not why? I think that the allegations against the former Chief Justice should be investigated not by Parl;iament ( we do not have House of Lords where eminent lawyers are represented. Our Parliament doesn’t have any persons who can carry out such an iquiry. We do not want a witch hunt for it will damage the independence of the Judiciary. It was during the term of offcie of the former CJ that Parliament should ahve gone into these allegations. But we are a spineless people who prefer to attack a person when he has fallen from grace. Such are our ethcial values. I am not a lawyer but I dont think there is constituional provision to carry out such an investigation after the Judge has ceased to hold office. I would prefer not to inquire into the allegations if it is by Parliament. Any person involved with a political party, should not contest for the Presidency of the BASL, Wijedasa Rajapakse is cheating himself & others if he says he’s impartial!! He can never be! It’s people like Judge Warawa, who are courageous, and righteous who should contest! The question is, do we have such noble characters among the members of our BASL? We need such a person at a time like this where the judiciary is corrupt,and biased! Let us hope BASL will choose a good person as President, not a Rajapakse lackey!! That was an expression to which I was introduced by the teacher who taught us geometry.I could not grasp the significance of that expression in Latin. It took me 55 years more and the contest for the Presidency of the BASL to recognize the significance of that concept. Wijedasa Rajapakse, canvassing for the Presidency of the BASL in an interview with the Sunday Leader had made two comments to seek support. The first is that when the BASL decided unanimously to refrain from appearing for Potta Naufer in the Ambepitiya murder case, his opponent broke ranks. Uvindu Kurukulasuriya had commented adversely on Rajapakse’s statement, wherein he had quoted the Sri Lankan Constitution. He had missed the fact that the Lawyers are bound by their oath to provide such defense and to treat accused as innocent until he is proved guilty. In fact one should respect Walaliyadde for standing up for a principle when the Association as a whole arrived at decision based on emotions and not on their training. The second being response to the defense of Human Rights, wherein he states that he had accepted many a case defending the clients human rights. Good, but salient requirement he ignored was to clarify whether appearing for a client was free of charge or not. I prefer to believe that he was paid for his appearance, may be a few hundred thousand rupees.To prove his bona fides he could have used another forum where again he is paid, paid by the tax payer, the Parliament. Mr Rajapakse had been in the Parliament since 2004, and it is unfortunate that the news papers never reported a speech by him on any critical issue on which he is qualified to comment. This contrasts with the effort of Ravi Karunanayake, Dayasiri Jayasekara and Sujeeva Senasinghe. Rajapakse being an erudite speaker and an educated individual is duty bound to make his comments. In a society where the priest of Damma have gone corrupt , where the agents of justice have compromised and exchanged their profession for money and power, Rajapakse is only an symbol of the de-civilization that is in progress.